Swiss lace hair system base is very soft, completely undetectable and breathable. Swiss lace hair system is the greatest choice for the people who are facing complete or partial hair loss due to some health situations. It is the top natural lace, thin thickness, after bleach knots. Our lace systems are extremely popular and have totally natural hairlines men hair systems. If you are interested in the supernatural look, so Swiss lace hair system is a good choice. It considered as the most undetectable lace material on the market. Swiss lace hair system can hold medium light density at the maximum for short hair. It’s transitional density hairline give it amazing realism in any light. Clients also like it for its light, airy feel and comfy. If you have long hair, we recommend light density or even less. So if your hair density is weightier than medium light. Since Swiss lace hair system is very careful, delicate use and maintenance are required. 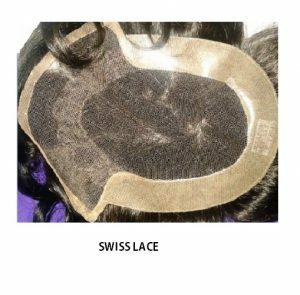 Swiss lace lifespan is shorter than a full French lace hair system.